Pope Francis has asked 80 year old Italian Sister Eugenia Bonetti to write this year’s Way of the Cross meditations for the evening service at Rome’s Colosseum on Good Friday. Sister Eugenia has been on the frontlines in the fight against human trafficking for a number of years and it is understood that the suffering of many people who are victims of human trafficking will be the central theme of the meditations. “Sister Bonetti is a leader among religious women working against human trafficking. She started and led anti-trafficking initiatives for the Italian Union of Major Superiors and helped educate officials in Italy and the United States about the problem. In 2013, Sr Bonetti asked Pope Francis to help raise greater awareness in the church about the problem of human trafficking by establishing a worldwide day of prayer and fasting. The pope was very interested in this suggestion and asked what would be an appropriate date. The Sisters suggested February 8, the feast day of St. Josephine Bakhita, a Sudanese slave who found freedom in Italy and became a nun in the late 19th century. The next year, Pope Francis asked the international unions of superiors general of men’s and women’s religious orders to promote the initiative. This led to first celebration of the International Day of Prayer and Awareness Against Human Trafficking on February 8, 2015 and each year since. On Good Friday we too remain conscious of the exploitation, abuse and suffering of our sisters and brothers who are still being trafficked and exploited in our world. 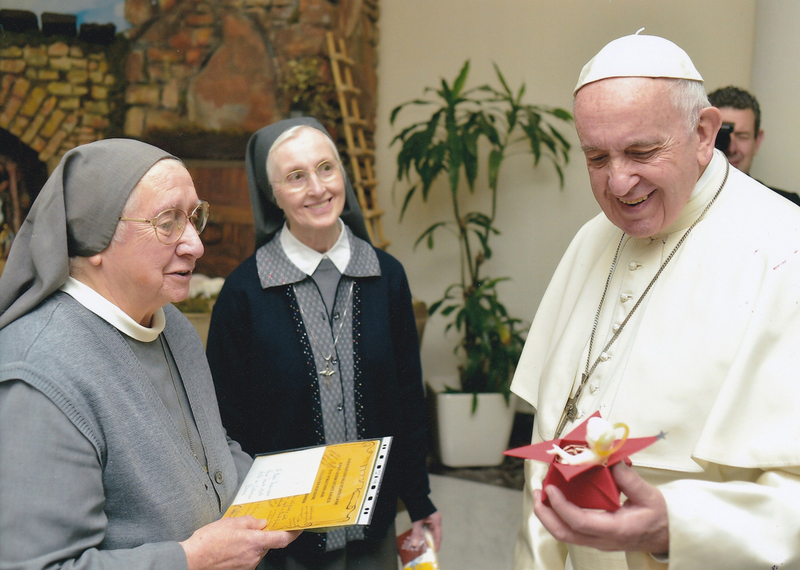 (Left) Sr Eugenia Bonetti with Pope Francis and another Sister.